HTC has denied claims that its new flagship One A9 smartphone copies the iPhone. At a press briefing in Taiwan, company executive Jack Tong said that "it's Apple that copies us" in terms of antenna design—the Taiwanese handset maker was first to release a metal unibody smartphone nearly three years ago. "We're not copying. We made a uni-body metal-clad phone in 2013. It's Apple that copies us in terms of the antenna design on the back," Jack Tong, president of HTC North Asia, said at a press briefing at the Taiwan launch of the One A9. "The A9 is made thinner and more lightweight than our previous metal-clad phones. This is a change and evolution, and we're not copying," he said. The original HTC One M7 launched in March 2013 with an aluminum unibody frame and plastic antenna lines along the top and bottom of the smartphone, both design cues that Apple adopted for the iPhone 6 and iPhone 6 Plus, released 18 months later, and has since carried over to the iPhone 6s lineup. The One A9 is considered an iPhone lookalike because it has a similar rounded chassis, plastic antenna lines and a protruding rear-facing camera, and because it is available in almost identical colors as the current iPhone lineup. The smartphone also has one speaker located next to the charging port on the bottom. HTC's rebuttal comes after The Verge described the One A9 as "the most blatant and highest-profile iPhone ripoff since Samsung's original Galaxy S," a bold argument that has been contested by some HTC supporters. The copycat allegations have received significant media coverage this week. Ultimately, while there is no denying that HTC's One A9 is an iPhone-driven evolution of the HTC One series, it is clear that both smartphone makers have borrowed similar design qualities from each other over the years. Apple has not commented on the matter, but has taken legal action against Samsung for copying in the past. The One A9 is HTC's latest flagship Android smartphone, featuring a 5-inch screen with a curved-edge display, 13-megapixel rear-facing camera, 1.5 GHz octa-core Qualcomm Snapdragon 617 processor, 3GB of RAM, 16GB or 32GB storage, Quick Charge 2.0 and Android 6.0 Marshmallow. The smartphone is available in a range of colors, including Carbon Gray, Opal Silver, Deep Garnet and Topaz Gold, for $399 unlocked. Didn't the iPhone 5 have a "uni-body metal-clad" design, with plastic bands at the top and bottom for antennas? And that came out in 2012. And they coincidentally named it the A9...the same chip that's inside the iPhone 6s. No confusion there. Honestly, who cares at this point. One runs iOS, the other Android. That is all that really matters IMO. Who really is 100% original these days with no influences from competitors? No one. The metal finish, corner radiuses, flat back, curved front glass that blends with the sides, camera ring, two-tone flash, speaker grill, etc. 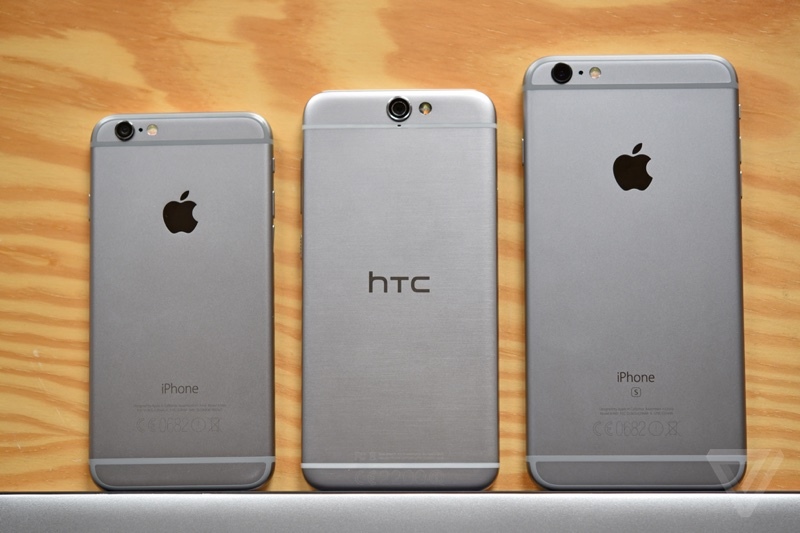 are all more similar to the iPhone than any past HTC One phone. The iPhone 6's design is basically a 5th-gen iPod touch with a curved front glass and antenna breaks. Really the only new thing HTC brought first was the antenna breaks. They can brag about innovating on antenna breaks all they want, it's not representative of a phone's entire design and doesn't negate the fact they took inspiration from other aspects of the iPhone's design. Looking at the '13 HTC One, he does have a point. I'm not saying Apple copied them, but they did have the antenna lines on the back way before the iPhone 6. They even had Beats before Apple too, haha. Apple copied us!..........so we copied their........copy? Edit: And I'm as big a fanboy as anyone. MacBook, iPhone, iPad, Apple Watch, etc. "Apple copied us last year! So we made sure our phone looked even MORE like theirs this year!"